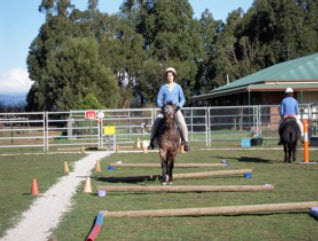 Based on Adult Riding Club and Pony Club Activities in Australia. 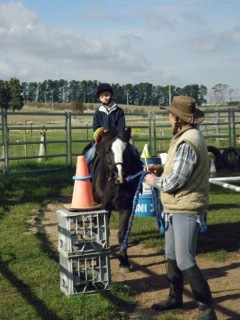 rider has to pick up a ball from a helper, ride to far end of arena and drop in into a bucket or crate. Ideas: hold a billycan or basket of 4 balls, have 4 buckets/crates- one@ each corner of arena. Rider drops one ball in each as he goes around arena, or rides a certain path before dropping the ball i.e. must always come down the centre line. Skittles make good articles to complete this activity too – make it harder by having them stand the skittle on an upturned crate! 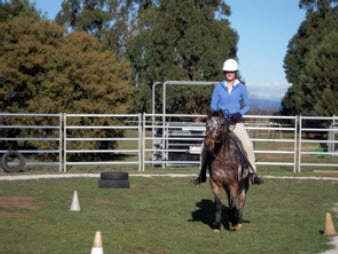 Ideas: have a series of 4-6 cones down the centre line, give the rider a ball, one at a time to put on each cone in turn. Make it harder: Give the rider a can of four balls and has to place the balls one at a time on designated cones. 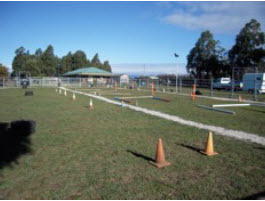 using plastic quoit [tossing] rings(6 coloured) rider has to put them over a cone on a crate at specific areas around arena- e.g. corners, down long side, at letter markers. Ideas: Riders carry all 6 rings and complete in a sequence as directed by leader, or must ride a specific path, i.e. down centre line… each time they deliver a ring. 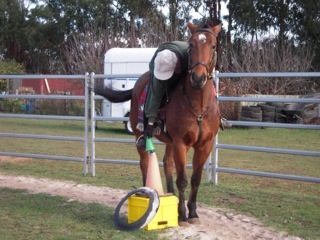 As the riders get more confident put cones on ground to make placing rings more demanding. 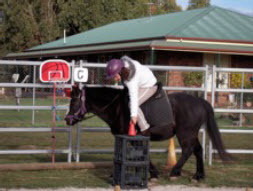 rider using a small aquarium net has to ride a specific path to the end of the arena where plastic coloured balls are in a bucket of water, on a crate. Once at the bucket the rider has to ‘fish” out a ball (or harder: specific coloured ball), carry it carefully back to 2nd bucket and “deliver it” into that bucket. The Sticks game has the same set up as for the Ball in Bucket/Crate game but this time using small hollow tubes/sticks/batons etc…. Idea: If using hollow tubes, try to thread them onto another stick/pole set up around the area. These can also be used for relay races (batons) and don’t forget that the inner cardboard tubes from toilet rolls or cling wrap etc are good “tubes” to use. make a set of flag poles from bamboo garden stakes and champagne corks. Use large cones to be placers- they have holes in the top. Set cones either in a straight line down the centre of arena or as wanted, i.e. on the corners. 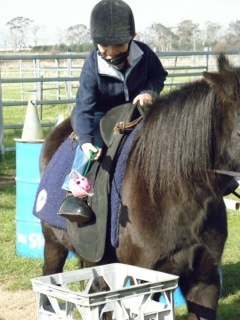 Rider carries one at a time and places it the designated cone in the arena. Ideas: to finish activity get the rider to pick up the flags again, either one at a time or try several, one after another. A proper flag pattern made from material could be added to make flag more authentic. put 8 ice cream containers @ rider height around arena at dressage letters. Have sets of the letters, on cards, laminated, for durability and the rider has to deliver the letters to the appropriate mail box. The leader may say a specific order, or one at a time, always coming back to X, to finish, the rider has to collect the mail from the boxes… balls or corks or small soft toys … whatever is unusual as a “parcel” to deliver. The younger riders might like to carry a “bag” with the mail in it to deliver…. using a badminton racquet, get the rider to balance articles on it as they ride a specific route. As a relay race, you can have the riders try to pass the article to the next rider!! 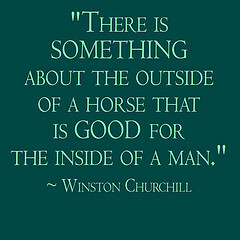 Takes some careful thinking!! the normal idea of balancing an egg on a spoon for a certain route etc.. except use balls of different weights, sizes that fit the spoons(tablespoons are best) or apples or potatoes. can make it harder by specifying pace, i.e. walk to deliver egg and trot home etc.. Needs a kids hoop and backboard at one of the arena, can have a crate under net to catch ball. Same ideas as for Soccer Game except this time must score a basket to gain a point. Ball can fall into crate-5 points, on the ground-3 points etc..
Can be played as a team event. Maybe have two hoops set up, one at each end. need kiddies plastic golf set and small plastic balls. Rider has to knock balls off cones set up around arena. need at least two microwave plastic food stainers and several light balls. 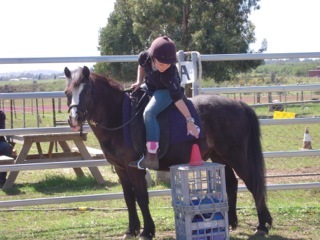 Act 6: Try to throw and catch at a walk/ trot etc…. Using normal Grip Ball equipment, but try to throw and catch mounted. Will need unmounted helper. 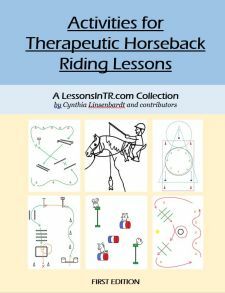 Rider has to complete directed activities balancing a beanbag on head, or carrying it on outstretched arm, under chin, under bottom, etc…. Need two plastic or metal cups and some “water’. Rider carriers the cups, one in each hand and as directed pours water from one to another as horse is lead around. Ideas: Fill one up and hold out to side, or above head, or half fill both and hold as aeroplanes, or above head, or straight out in front. Use Billycans or plastic honey tubs with handles. Rider has to fill can from one bucket and carry water to second bucket and empty into it. (and continue for a time limit, to an amount marked on bucket is reached..) A helper may be needed to fill the can for inexperienced riders!! Pace can be specified as the riders become more competent. needs several kiddy hopper balls with handles. Set up 4 or 6 crates around arena with a hopper in every 2nd crate. Riders pick up and deliver it to next crate etc. Beginners can just pick up and ride around a specific course. This is like a traditional hunt, except that the articles are placed @ points around arena and round yard, (& riding paddock if riders are more competent). The rider is given a list of articles to find, and a bag to put them in. Make an obstacle course to make it more interesting. Harder: pick up all 3 and drop it at the end of the arena into crate. Or pick up all 6!! Need 5 poles and 2 mugs. Set up poles in a line, mug on 1st and 3rd pole. 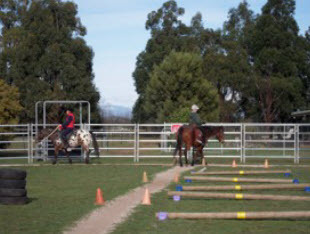 Rider rides to pole 1 takes mug and puts on pole 2, rides up around pole 5 and reverses mug position (Can add mug on pole 3 to go on 4) Must go through start finish cones. Need two cones, large, and 4 lags. Rider carries flag to top cone, places it in hole, rides back, picks up 2nd flag etc….. can be done as a relay. Rider carrying a bamboo stake, rides to a point in the arena, picks up a piece of litter (plastic bottle!) carries it back to bin and hands over pole to next rider…. or continues until all 4 bottles picked up. Thanks so much Nan for sharing your games with us! Do YOU have any games to share? I’d love to feature them! Please send them to me via the contact me page. I hope that these are useful….. 🙂 Just a bit excited to see them “posted”….. enjoy!